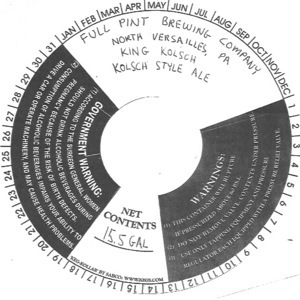 Full Pint Brewing Company, Mkgfb, Inc.
Full Pint Brewing Company King Kolsch is brewed by Full Pint Brewing Company, Mkgfb, Inc. in North Versailles, Pennsylvania. This brew is served on tap. We first spotted this label on May 21, 2013.